Nearly two-thirds of those who say they voted in the midterm elections (64%) say Trump was a consideration in their vote, while 35% say the president was not much of a factor. Overall, 39% say their vote was a vote against Trump, while fewer (25%) say their choice was a vote for Trump. These views are similar to those expressed in a survey conducted before the election: In September, 60% of registered voters said they viewed their vote as either a vote against Trump (37%) or for him (23%). 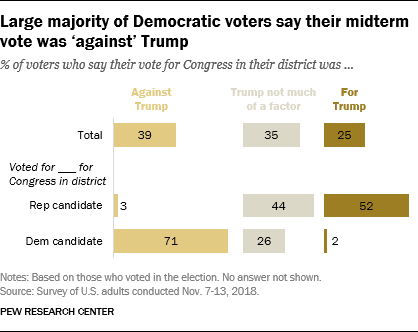 Among those who reported voting for Democratic candidates, 71% characterize their vote as a vote against Trump, while about a quarter (26%) say he was not a factor. Among those who voted for GOP congressional candidates, about half (52%) say their vote for Congress was a vote in support of Trump, while 44% say he was not a factor. A majority of Republicans and Republican leaners (60%) say Trump mostly helped Republican candidates in the House and Senate around the country. Three-in-ten said Trump helped about as much as he hurt, while 9% say he mostly hurt GOP candidates. Independents who lean toward the Republican Party are less likely than GOP identifiers to say Trump boosted the electoral prospects of Republican candidates. About half of Republican-leaning independents (49%) say Trump mostly helped Republican candidates, compared with two-thirds (67%) of those who identify as Republicans. Older Republicans are significantly more likely than younger Republicans to see Trump’s impact on GOP candidates as beneficial. Majorities of Republicans ages 65 and older (77%) and 50 to 64 (64%) say Trump mostly helped Republican candidates. About half of those ages 35 to 49 (52%) say he mostly helped, while 36% say he helped as much as he hurt. Republicans under 35 (45%) are far less likely to say Trump’s impact on candidates was mostly helpful. About four-in-ten say Trump had a mixed (41%) effect, and 13% say he did more to hurt Republican congressional candidates around the country. A majority of Republicans and Republican leaners (61%) say they would not like to see other Republican candidates challenge Trump for the party’s nomination for president in 2020. Four-in-ten Republicans (37%) said they would like to see a GOP challenger. This is roughly on par with views of Obama among Democrats after the 2010 midterm elections, when the party lost its majority in the House of Representatives. Following the 2010 election, 38% of Democrats and Democratic leaners said they would like to see other Democratic candidates challenge Barack Obama for the Party’s nomination in 2012. A majority (58%) said they would not like to see another Democrat challenge Obama. Currently, there are large differences among Republicans by gender and age when it comes to a potential GOP challenger to Trump in 2020. Two-thirds of GOP men (67%) say they would not like a Republican candidate to challenge Trump for their party’s nomination. In contrast, 53% of Republican women say they would not like a GOP candidate to challenge Trump, while 43% say they would like another GOP candidate to challenge Trump in 2020. Republicans ages 50 and older are considerably more likely than those under 50 to say Trump should not be challenged in 2020. Seven-in-ten of those over 50 say this, compared with just half of Republicans under 50. And while a majority of conservative Republicans (71%) say they would not like a candidate to challenge Trump, far fewer moderate and liberal Republicans (45%) say the same. The results of the midterm election had little effect on partisans’ feelings about the future of their parties. Most Republicans and Republican leaners (83%) are optimistic about the future of the GOP, while a comparable share of Democrats and Democratic leaners (81%) are optimistic about the future of the Democratic Party. Republicans are slightly more positive about their party’s future than they were just prior to the midterm election (83% today vs. 75% in October). 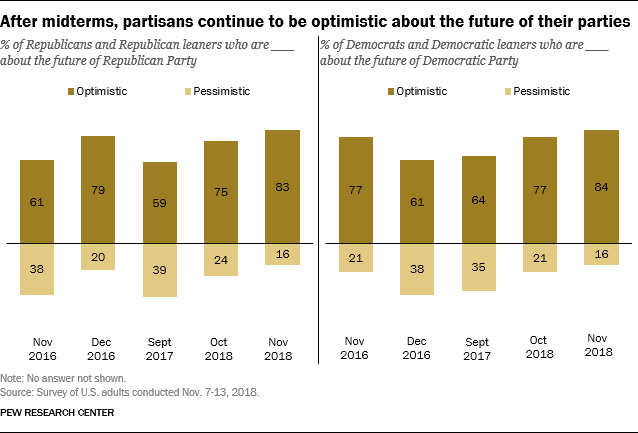 Democrats are about as optimistic about their party’s future as they were in October (77% then vs. 81% now).